Sialolithiasis is the medical term for salivary gland stones. These stones, or calculi, are mostly composed of calcium, but they also contain magnesium, potassium, and ammonium. Your mouth has three salivary glands that can develop stones: parotid, submandibular, sublingual, and minor salivary glands. Due to being large, long, and having slow salivary flow, your are most likely to develop a salivary gland stone in your submandibular salivary gland. Children rarely develop sialolithiasis. They are most commonly found in men between the ages of 30 to 60. Most stones only occur in one gland, however it is possible to have multiple stones form at once. Submandibular stones account for 80 to 92 percent of all sialolithiasis, while parotid stones account for most of the remaining cases at 6 to 20 percent. The sublingual and minor glands have relatively low risk for development of a stone. The digestive enzymes in saliva begin breaking down your food before you have even swallowed it and saliva is most commonly released in response to the smell and taste of food. Additional functions of saliva include helping us to swallow and talk. Saliva is produced by several glands located in the mouth and throat. The major salivary glands then transport the saliva through tiny tubes called salivary ducts which eventually release the saliva into various places in your mouth, especially under your tongue and on the floor of your mouth. 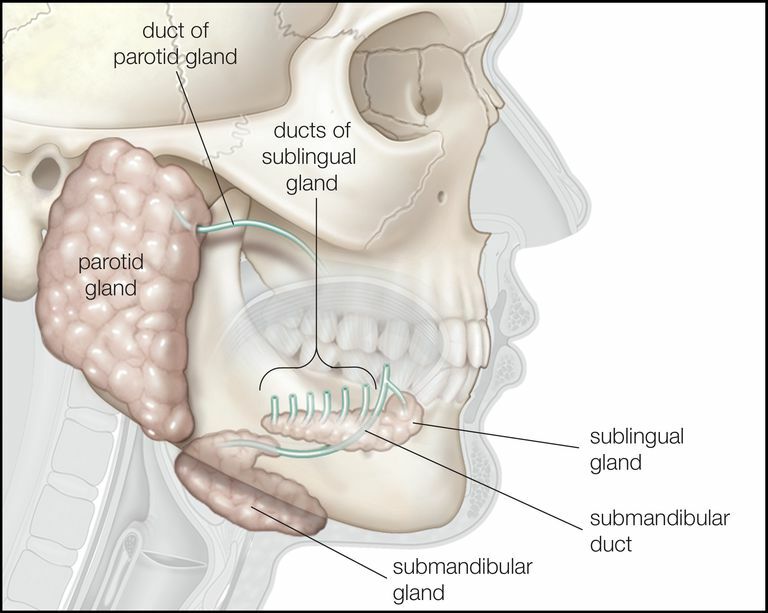 The three pairs of major salivary glands are called the parotid, submandibular, and sublingual glands. In addition to the major saliva glands, there are multiple smaller glands, called minor salivary glands, located in your lips, cheeks, and throughout the tissue lining your mouth. Small stones which do not block the flow of saliva can occur and cause no symptoms. However, when the flow of saliva becomes completely blocked it may cause the associated salivary gland to become infected. Severe infections of a salivary gland may cause profound symptoms including fever, fatigue, and sometimes noticeable swelling, pain, and redness around the affected gland. An otolaryngologist, or ENT, is a physician qualified to diagnose and treat sialolithiasis. Although doctors in other specialties may also diagnose or treat this condition. Your doctor will consider your medical history and examine your head and neck, including the inside of your mouth. Sometimes the stone can be felt as a lump. Historically a sialograph, where dye is injected into the salivary duct followed by an x-ray, was used, however this is more invasive than modern MRI or CT scans which are now more likely to be used. The treatment of sialolithiasis depends on where the stone is and how large it is. Small stones may be pushed out of the duct and you may be able to facilitate this by drinking plenty of water, or massaging and applying heat to the area. Sometimes a doctor can push the stone out of the duct and into the mouth by using a blunt object and gently probing the area. Large salivary duct stones may be more difficult to remove and sometimes require surgery. Sometimes a thin tube called an endoscope can be inserted into the duct. If the stone can be seen with the endoscope the doctor may be able to insert another tool that is then used to pull the stone out. Sometimes removal of the stone can be achieved with a small incision, in severe cases the entire gland and the stone may have to be surgically removed. In the case of an infected gland, your physician may prescribe an oral antibiotic. Never take antibiotics without seeing a physician.